Alcohol is a part of life for all Alaskans, whether they drink or not. Present at nearly many celebrations and social events, it’s also a thread that runs through many of Alaska’s toughest challenges and tragic situations. Its a factor in drunk driving tragedies, violence on city streets, Anchorage’s growing homeless population, and lifelong disabilities when a fetus is damaged by a drinking mother. Attempts to curb its influence have yielded mixed results. Prohibition in rural villages has spawned thriving bootleg activity. Decades of attempts to reduce the number of chronic alcoholics in Anchorage have been largely unsuccessful. 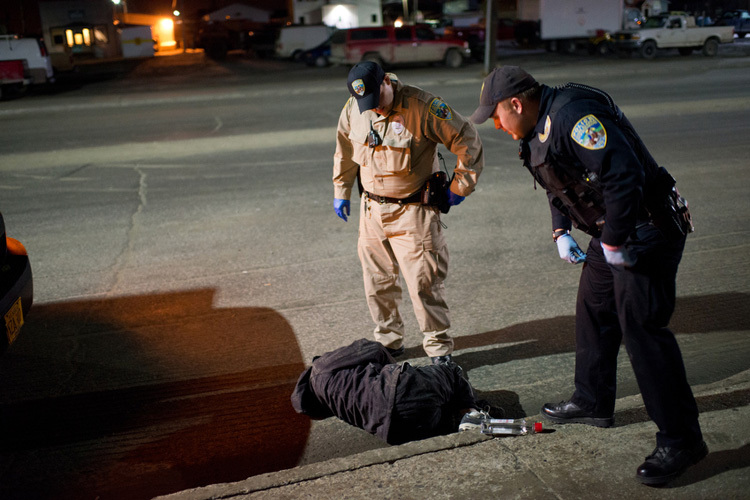 Several chronic alcoholics die on the streets each year. The state of Alaska carries some of the highest rates of Fetal Alcohol Syndrome nationwide, a condition that leads to lifelong learning, behavior challenges and often criminal records. The photos and videos featured here are part of a long-term project, produced in 2013 and 2014, to explore the many ways alcohol is a part of our culture and many of the unintended consequences that all Alaska residents face.